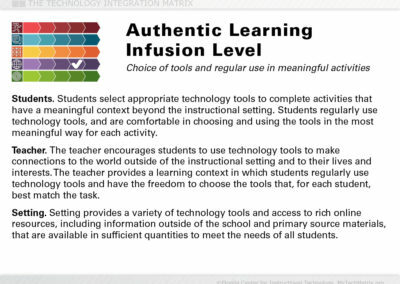 At the Infusion level, a range of different technology tools are integrated flexibly and seamlessly into teaching and learning. 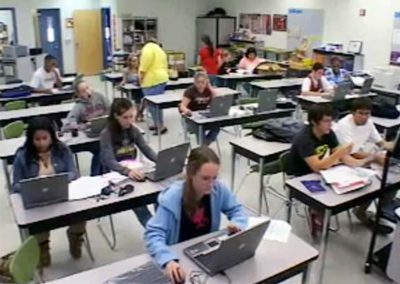 Technology is available in sufficient quantities to meet the needs of all students. 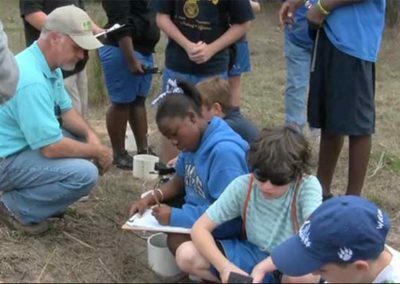 Students are able to make informed decisions about when and how to use different tools. 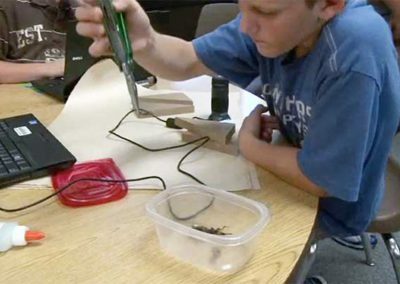 The instructional focus is on student learning and not on the technology tools themselves. 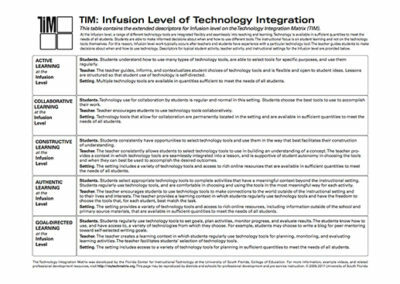 For this reason, Infusion level work typically occurs after teachers and students have experience with a particular technology tool. 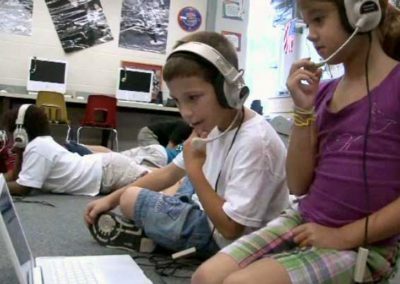 The teacher guides students to make decisions about when and how to use technology. 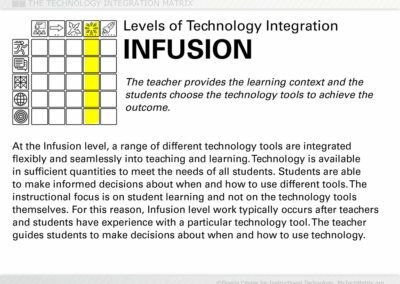 This page provides greater detail about the Infusion level of the Technology Integration Matrix. 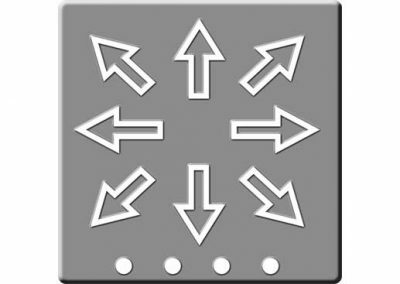 To see the entire matrix or to locate other levels, return to the Matrix. 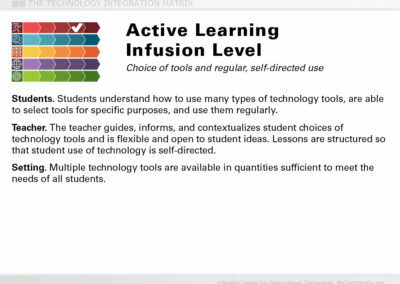 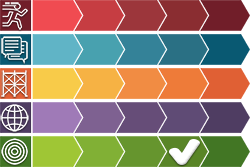 Descriptors for typical teacher activity, student activity, and instructional settings at the Infusion level are provided below, along with links to all of the Infusion level video lesson pages and additional resources. 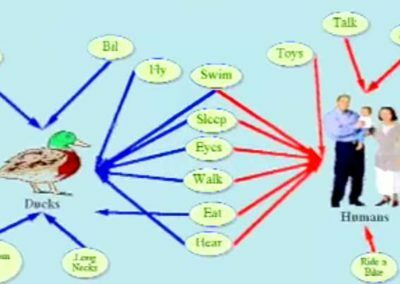 Students understand how to use many types of technology tools, are able to select tools for specific purposes, and use them regularly. 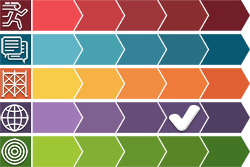 The teacher guides, informs, and contextualizes student choices of technology tools and is flexible and open to student ideas. 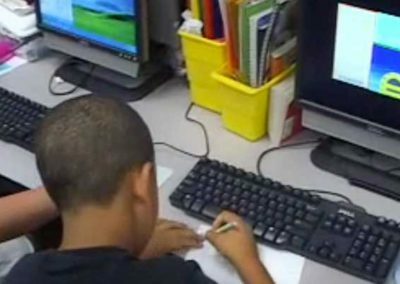 Lessons are structured so that student use of technology is self-directed. 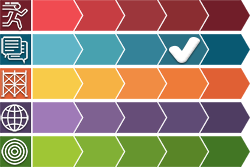 Multiple technology tools are available in quantities sufficient to meet the needs of all students. 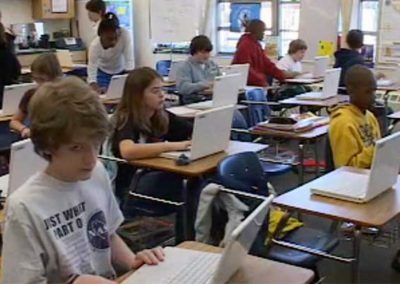 Technology use for collaboration by students is regular and normal in this setting. 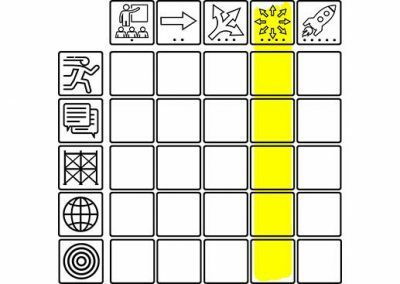 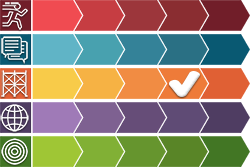 Students choose the best tools to use to accomplish their work. 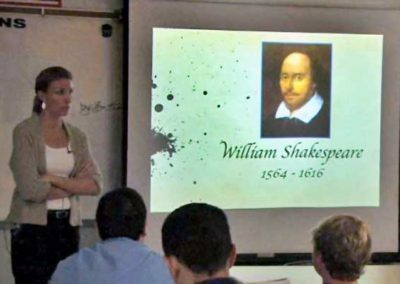 Teacher encourages students to use technology tools collaboratively. 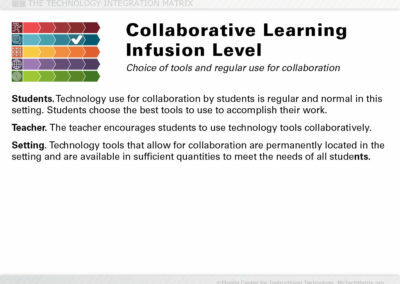 Technology tools that allow for collaboration are permanently located in the setting and are available in sufficient quantities to meet the needs of all students. 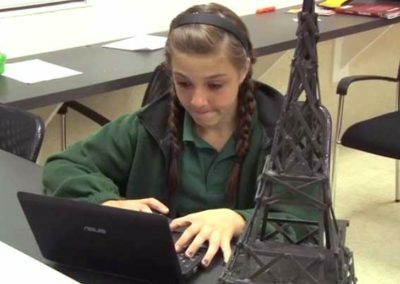 Students consistently have opportunities to select technology tools and use them in the way that best facilitates their construction of understanding. 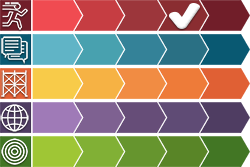 The setting includes a variety of technology tools and access to rich online resources that are available in sufficient quantities to meet the needs of all students. 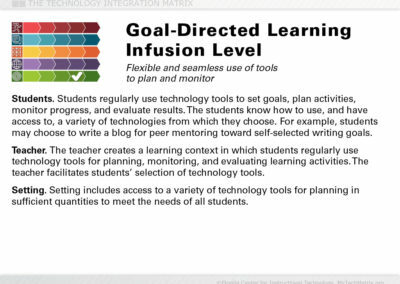 Students regularly use technology tools to set goals, plan activities, monitor progress, and evaluate results. 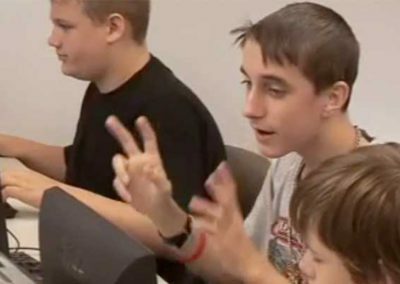 The students know how to use, and have access to, a variety of technologies from which they choose. 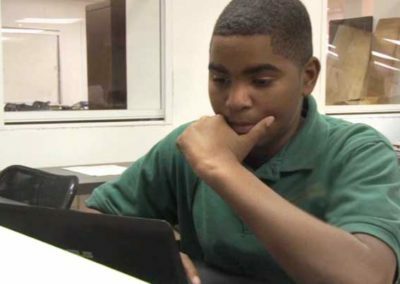 For example, students may choose to write a blog for peer mentoring toward self-selected writing goals. 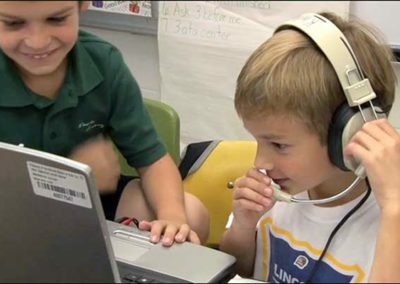 The teacher creates a learning context in which students regularly use technology tools for planning, monitoring, and evaluating learning activities. 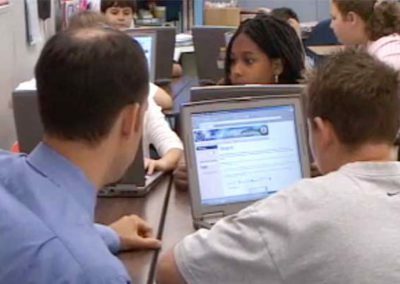 The teacher facilitates students’ selection of technology tools. 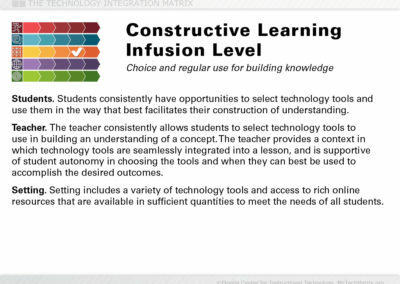 The setting includes access to a variety of technology tools for planning in sufficient quantities to meet the needs of all students.